In Washington, D.C., an area where black male students are the lowest-performing demographic on standardized tests, one Belmont alum is committed to empowering his students. Michael Redmond (’13), a graduate of Belmont’s Masters of Arts in Teaching program and a current Doctoral student at George Washington University, is the assistant principal at Truesdell Education Campus. 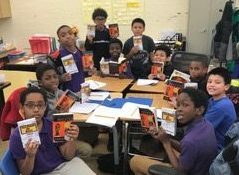 He recently helped students on his campus organize an all-male book club which meets a few times a week before school starts to discuss their reading and their own experiences with race, identity and adolescence. His efforts have recently been featured in the Washington Post.